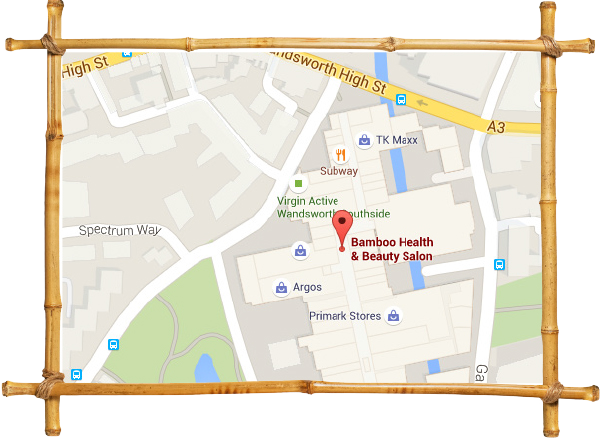 Bamboo is a peaceful salon inside the Southside Shopping Centre. Our highly qualified Therapists use a variety of techniques and products to help you to feel relaxed, away from the buzz of everyday life. Our Massage therapy team is available to do Sports/Deep Tissue Release, Relaxation Massage, and Pregnancy Massage. We offer Manual Lymphatic Drainage, and Anti-cellulite treatments. This amazing inch loss treatment consists of 3 gels and a cream, applied in a 2-stage process, and it continues to work for up to 12 hours after the treatment! There are no bulky bandages, and it is truly effective (but not for pregnant women, or those breastfeeding). Treatments are 1 to 1.5 hour and cost £80 per session. Discounts are offered for courses. Ask for details. This type of massage consists of five basic strokes: effleurage (stroking), petrissage (kneading), friction, tapotement (percussion), and vibration and was developed by a Swedish Physiologist in the 19th Century. Alleviate stress, ease aching muscles, and revive the senses with this powerful massage. A non-invasive drainage massage to decrease the appearance of Cellulite, or improve lymphatic drainage. The lymphatic system is a complex network of vessels and ducts that move fluid throughout the body and it is responsible for moving toxins away from healthy cells and carrying germ-fighting materials to cells when they are under attack. The lymphatic system does not have its own pumping mechanism and therefore, this type of therapy is intended to help the body produce a free-flowing lymphatic system. A lymphatic drainage massage primarily focuses on specific lymph nodes and points of the body, as well as the natural flow of the lymphatic system. This process will reduce blockages of the lymphatic system, which in turn promotes a healthier body. We also have an incredible new IPC (intermittent pneumatic compression) machine, which assists lymphatic drainage (especially in those with lymphoedema, or those performing in high level sport who need something as an adjunct to their sports massages). It also helps to improve the look of cellulite – ask us about the combined treatments of gel + IPC for sports release, or for added cellulite reduction. A gentle, luxurious massage, where you are in control of the depth of the muscle release. Anyone can benefit from a sports massage, including people in physically demanding jobs and those with other emotional, occupational and postural stress, or those who just enjoy a deep tissue massage. Remedial massage uses a base of Swedish massage techniques to achieve balance. Although many clients who consult a remedial massage therapist have pain as a result of specific injuries (whiplash, falls, sports injuries, etc. ), repetitive strain injuries (RSI) and other work-related problems, the vast majority originate in postural alignment problems that sometimes go back to childhood and adolescence. A gentle and safe treatment for mums to be. A treatment done on your feet to promote balance and wellbeing.